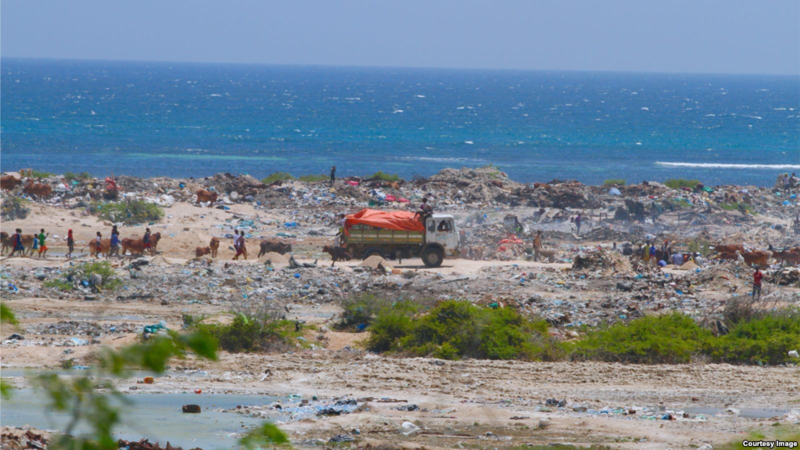 Mogadishu is a city of some 2 million people that produces an estimated 2,500 metric tons of garbage per day. And yet until very recently, it had not had a single designated trash disposal site or recycling plant. Instead, people dumped, and mostly continue to dump their trash in the streets, on the beaches or into the ocean itself. Photos acquired by the VOA Somali Service program Investigative Dossier show the extent of the problem. One picture captures a market worker dumping a wheelbarrow full of discarded fish scraps into the water. Others show huge mounds of cans, bottles, plastic bags, boxes, food waste, scrap metal and other trash strewn across the beaches, with goats and the occasional scavenger picking through the remains.